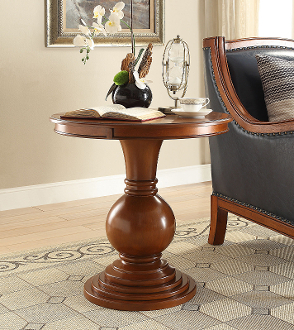 The Rosemont Pedestal Table is an elegant addition to any décor. Perfect for holding a lamp or a picture frame, this accent table fits any room and has a classic design. This pedestal table is constructed of solid and composite wood that is stylish, strong and sturdy. It offers a 26 inch round top and is finished in a burnt chestnut color over birch veneer. Simple five minute assembly required (3 pieces, 6 bolts). Dimensions: 26"W X 26"D X 26"H.